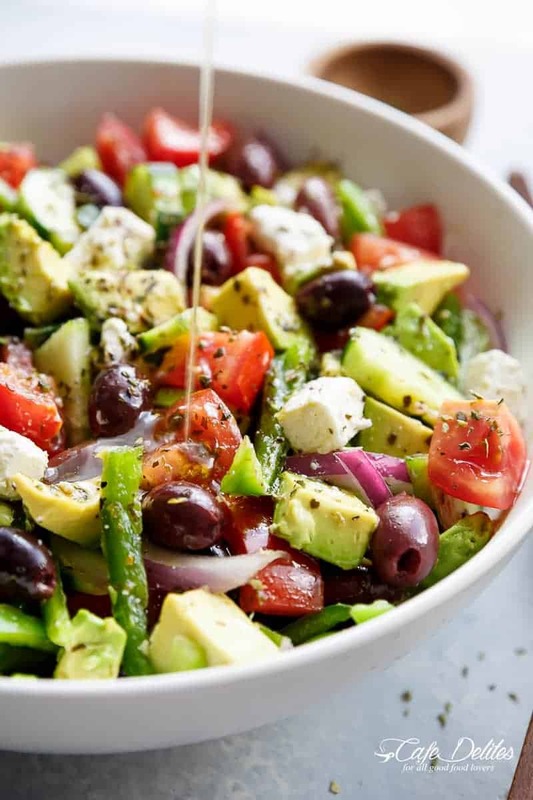 Avocado Greek Salad with a Greek Salad Dressing is a family favourite side salad served with anything! 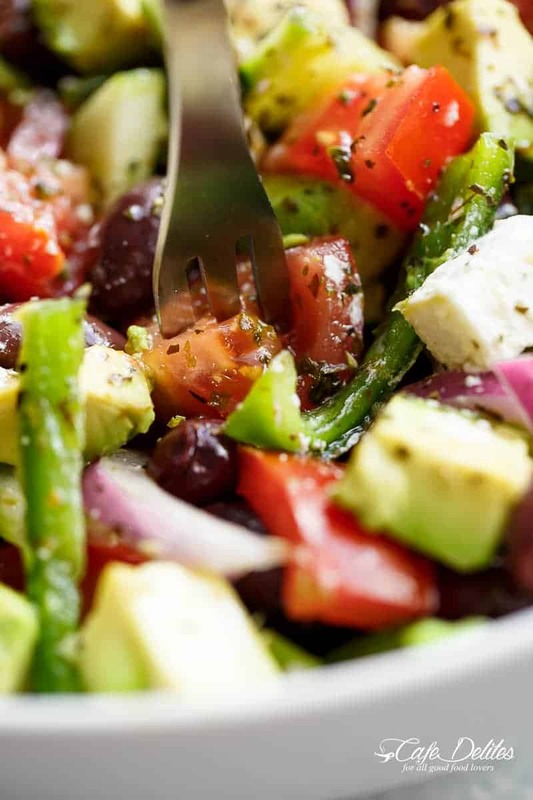 A twist on the traditional Greek Salad! Loaded up with creamy avocado and a touch of lettuce along with green peppers (or capsicum), tomatoes, cucumbers, feta, olives, and onion. The best side salad for any meal! In this house, however, we always add avocado. Avocado – on – everything – addiction. And why not?! It’s such a great addition, you’ll be doing it too! 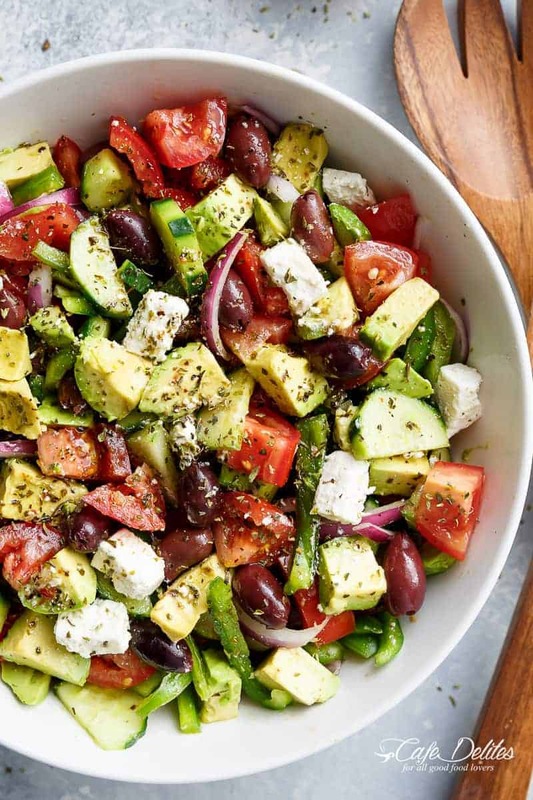 This salad has been happening daily WITH EVERYTHING Greek-flavoured. Greek lamb chops? Done. Greek chicken? YES! That’s not all though…Avocado Greek salad goes with anything! With all this Greek Salad making and eating, I have to say what makes a good Greek salad even better is a dressing so full of flavour you could drizzle it all over your meat like we do (and like I did here with this Greek Lemon Garlic Chicken Salad). It only takes a few ingredients that I bet you already have in your kitchen. Throw out your bottled dressings. Once you realise how easy and fast it is to make your own, you’ll be giving the bottled stuff the flick. What goes in a Greek Salad Dressing! Dried oregano — in the seasonings section of your supermarket. Want to bulk up your salad? Add lettuce like we have here (I love Romaine or Cos). Whisk together dressing ingredients in jug or jar. Mix together all of the salad ingredients in a large bowl. Toss with dressing. Season with extra salt ONLY IF NEEDED (depending how salty your feta cheese is). To serve, sprinkle over extra oregano (optional). Serve with chicken, fish, lamb, beef, the options are endless! This has been my go-to greek salad, sinse i found your website. I put green olives in it, instead of the black ones, but the dressing is to die for! Honestly this can be eaten with anything! Thanks again for the comment! So glad that you like this also! Is there anything other than feta I could use as my partner is lactose? This will serve about 4 to 6 people. This is one of the best recipes I’ve ever gotten off Pinterest. My pet peeve is when people rave about a recipe but mention they changed half the ingredients. This needs no changes & I’ve lost count of how many times I’ve made it!! If you need this to last more than a day, I say skip the avocado. Mine became a kind of cream and emulsified into the dressing by the next day. I think I will just add to individual servings in future. Overall, excellent salad! This is an absolutely fantastic recipe and will go down in history as one of my 5 go to salad recipes. Amazingly enough, I didn’t even have to “fix” this one, either…it was perfect right out of the gate. Thank you so much! I must be missing something? Can’t see the actual recipe? This looks fantastic! My family makes a salad that is cucumber, tomato, feta and avocado. I can’t wait to try your version- we love olives! ME too!! I love olives! I hope you enjoy this salad! Your salad sounds great too! I am always loving a good homemade salad and salad dressing! Thanks so much for sharing and following along with me! I made the Greek salad with the Greek marinated lamb chops. Both were a big hit and will go in my permanent recipe rotation. Thanks! YAY!! That is exciting! I am glad it is a keeper! Thanks so much for sharing! This looks awesome and easy to make, I can’t wait to try. Have you ever soaked red onion in cool water a few minutes to take the bite out? It is great, it really helps on the strong ones. 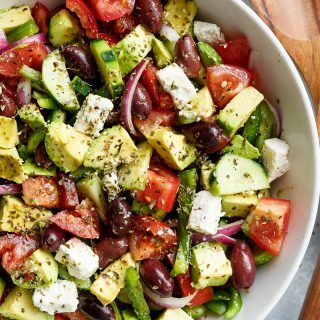 as an origin Greek I have to say this is a perfect alternative greek salad-we tried it today and we had really enjoyed it! Do you recommend eating this salad cold or room temperature? This is such a fresh and great tasting salad! 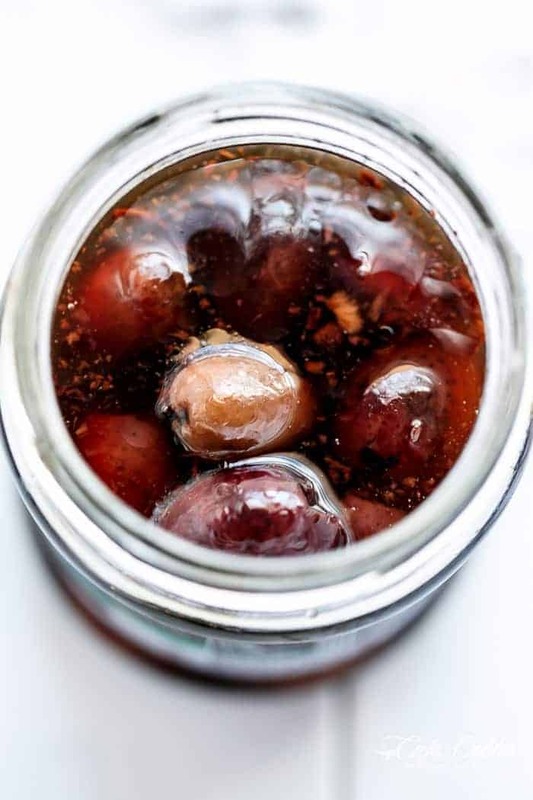 I normally do not like Kalamata olives so I spent a little extra money on authentic Greek Kalamata Oilves and I am so happy I did! Sarah, I am not sure if anyone answered your question about how many it serves, I would say at least 10. I fixes this salad for a group of 25 people and I am sure not everyone ate it, I have enough left over for a yummy side salad. How many servings would you say this makes as a side salad? I made is last night and it was gorgeous! A taste of Simmer on a dull day. It is definitely going to be a regular feature in our house. I added asparagus. Great dressing. Greek salad was so delicious its looks really colourful and yummy. i would try it. This salad is amazing ! This was delicious !!!!! I didn’t get to use the Avocado because it wasn’t ripe enough. Looks amazing will make this soon. OMG such a gorgeous tasty-looking salad! Totally love the fact that you added some good old avocado for a unique twist on the classic salad. I’m in love!